How Much Does it Really Cost to Own a Pool? When you are thinking about buying a pool, there is more than just the initial cost to consider. A pool may be on your property for decades and it must be cared for to last. Maintenance costs vary greatly depending on the choice of material and the expected lifespan of the pool.There are three major types of pools: concrete, vinyl and fiberglass. Ask anyone who owns a concrete pool all they will tell you that the costs involved in maintaining a concrete pool can be considerable. The average costs for maintenance run between 10% and 15% per year based on the initial cost of the pool. For example, if you paid $30,000 for your pool you could anticipate between $3,000 and $4,500 per year in maintenance costs. Concrete’s high maintenance costs are due to the nature of the material. The rough, porous surface collects algae and requires more chemicals to control its’ growth. Pumps must also run longer to filter the water, demanding more electricity. With rising hydro rates, this will likely be an increasing expense. Concrete pools also need frequent sweeping with a pool brush to remove algae from the plaster or aggregate surface. As concrete pools need this frequent maintenance, most concrete pool owners hire a service to visit once a week or every few weeks. Concrete pools also need to be drained each winter. When spring arrives, you must replenish the pool by pumping in thousands of liters of new water. Once again, you are spending money on electricity and water. A concrete pool must also undergo a thorough cleaning with a mild acid solution to kill spores and prevent algae bloom. This should be done at least every three to six years. Lastly, contrary to what many believe, concrete does not last forever. It requires resurfacing and re-tiling within 10 to 15 years. Vinyl has the advantage of a low initial cost and resistance to algae because of its smooth surface. It’s a good solution if a fiberglass pool is out of your budget. However the liner itself will eventually break down and will need to be replaced about every four years. If you live a cold climate, the chances of this happening more often are greater because of the stresses on the vinyl. Unfortunately, the warranties on vinyl liners only cover separation at the seams. Extreme weather can cause liners to tear anywhere when the vinyl becomes brittle, even when the pool has been properly maintained. The liners are also susceptible to puncture by sharp objects. Liners can cost upwards of $4,000 and this does not include labour. Of course, you cannot change a liner unless you drain the pool first, so you will incur the expenses for refilling it once it is repaired. Fiberglass has a smooth, hard finish that is extremely strong. The finish is non-porous, which inhibits algae growth and requires up to 70% fewer chemicals than concrete to maintain. 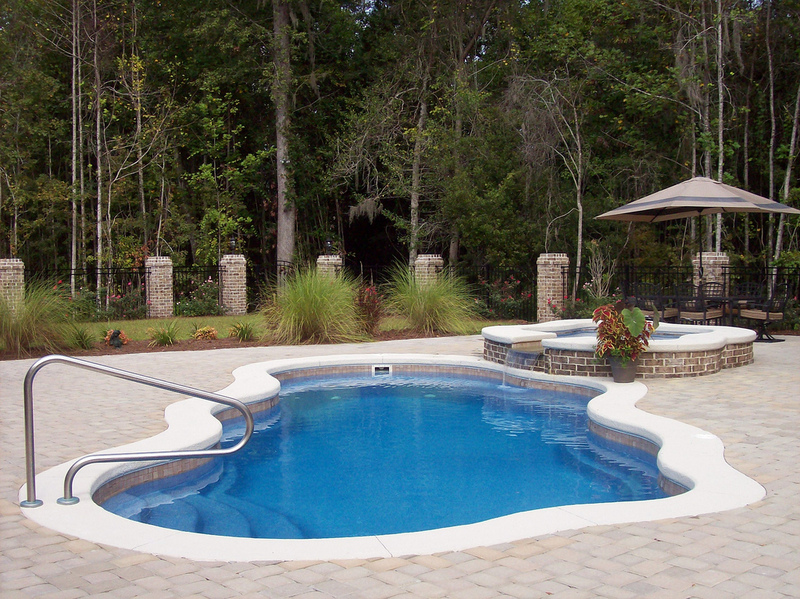 Many fiberglass pool owners opt to maintain their pool themselves as the process is simple and not very time-consuming. Water remains in the pool year-round and the pool normally only requires an annual check on the pumps and winterization of the pipes in cold climates. A reputable pool maintenance company will likely charge around $300 per year for this service. That is less than one-tenth of the cost of maintaining a concrete pool. A good quality fiberglass pool will also outlast a concrete pool if the shell is taken care of. Quality manufacturers guarantee their products for at least 20 years and some as long as 30 years. In the long run, fiberglass beats out both concrete and vinyl liner pools. They have lower maintenance costs, longevity and they are also less expensive to install than concrete providing you with the best overall value. Have questions about choosing an ingound swimming pool? Feel free to contact us here with your questions.